The Homegrown Trailer looks like it weighs (a few) tons, but at 2,000 pounds dry, it's not particularly heavy. 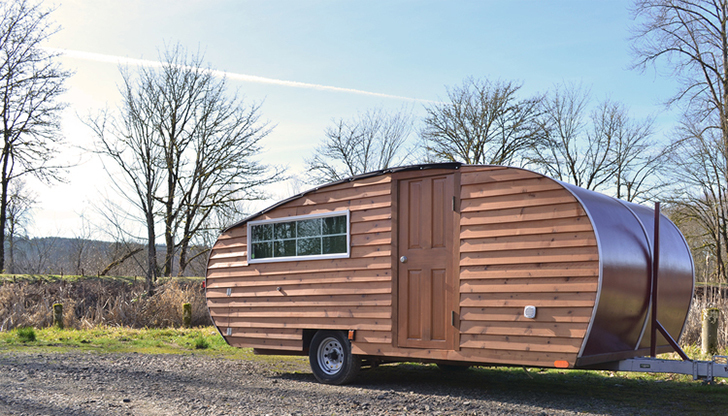 Homegrown Trailers, located in Woodinville, Washington, has set out on a mission to change how mobile living quarters get built. 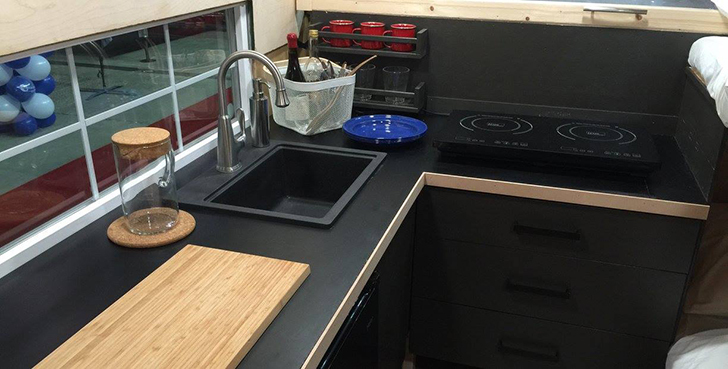 Sustainable materials feature in each of their trailer builds – and in many aspects of their business. 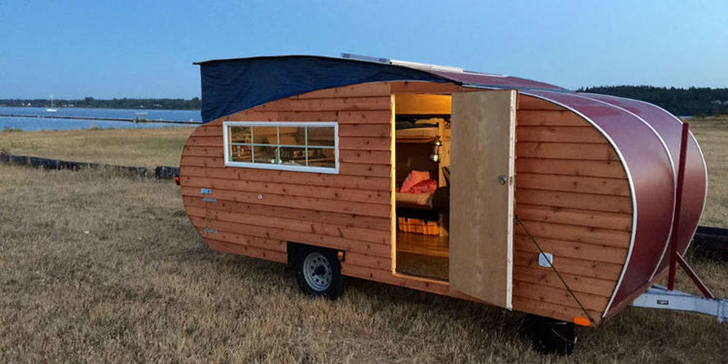 The Homegrown Trailer, made from sustainable materials, combines several RVs in one. At 2,000 lb., their Homegrown Trailer looks like a little cabin on wheels with its wood exterior paneling, full-size door, and rectangular window with muntins. The cozy interior, made with non-toxic materials and sustainably-harvested cork and bamboo surfaces, separates the design from a ‘normal’ RV. A hard-sided pop top is built into the roof for over 6 feet 5 inches of headroom and ventilation. 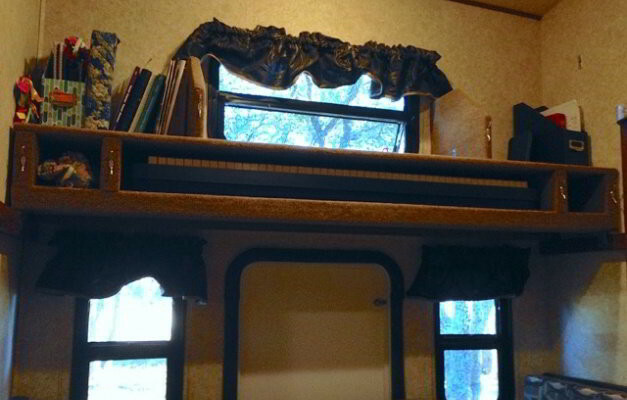 This hard sided pop top adds extra headroom to the kitchen and bedroom area. 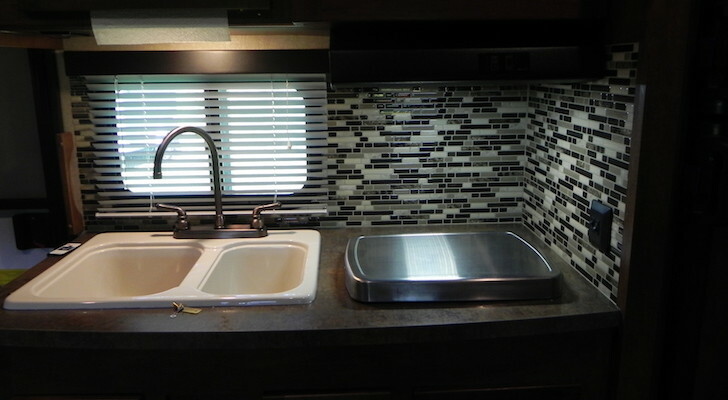 A full kitchen with induction cooktop, Energy Star mini fridge and 12 gallon fresh water tank are located on one side of the trailer, and a couch, drop leaf table and bunk beds that can sleep up to four people are located on the other. 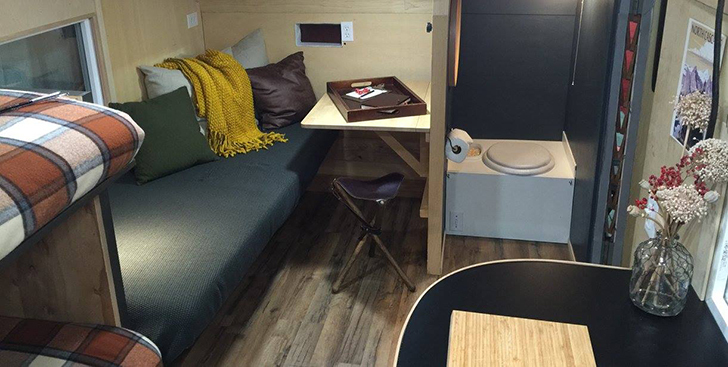 A composting toilet also fits into the 18 foot long camper. 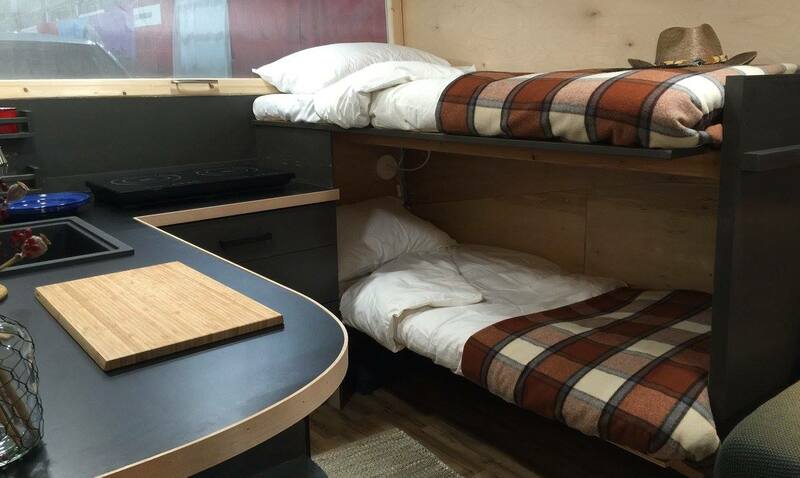 Four people can sleep on the bunks, while the bench turns into a queen bed. 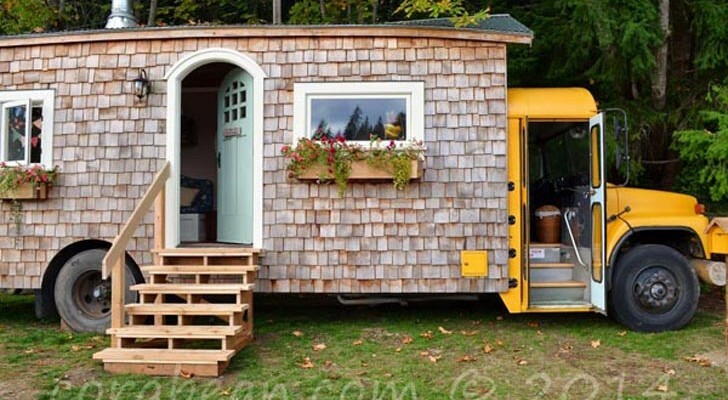 The camper also includes a drop leaf table and a composting toilet. The kitchen sink is served by a 12 gallon fresh water tank. 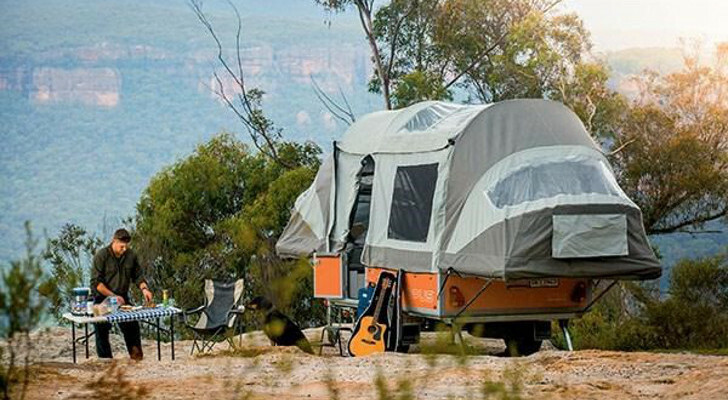 The Homegrown is 100 percent solar powered and includes 400 watt panels and a deep cycle battery with reserve power for up to two days of off-grid camping. 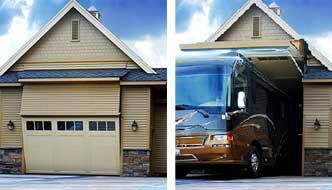 Energy efficient lights and appliances are also included. 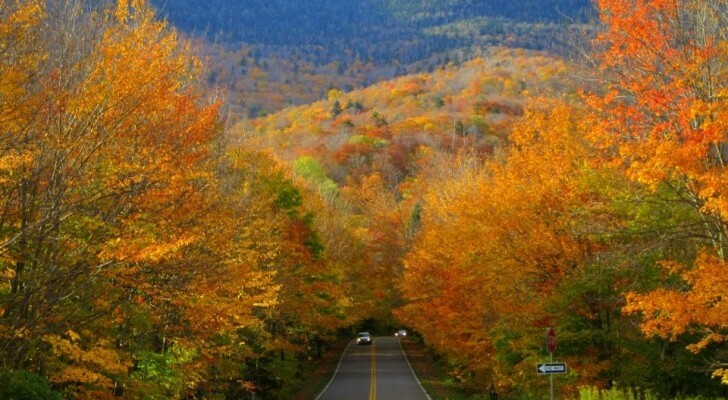 An extended off-grid package is also available with an additional 400 watts of solar panels. It looks a lot heavier: dry weight is just 2,000 lbs. The Homegrown Trailer is currently being sold with special pricing during an Indiegogo crowdfunding campaign until March 31, 2016. 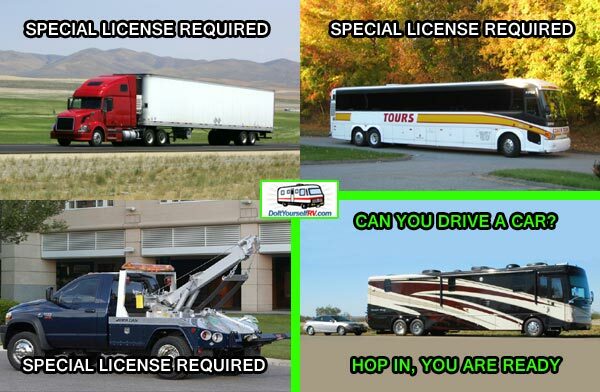 The initial price for these trailers is $28,995. However, if you want to try one out, you can rent one for $199 per night for three to five consecutive nights. Each rental comes with reusable dishes and flatware, biodegradable soap, recycled paper products, and cloth napkins. The Homegrown Trailer can be purchased or rented for days or weeks. 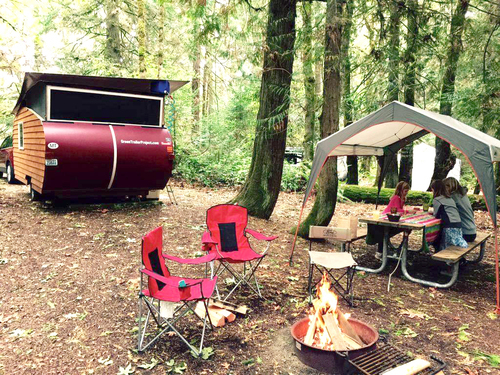 Homegrown Trailers also wants to join the ranks of the Airstream crowd with a dedicated community of owners and Homegrown lovers. 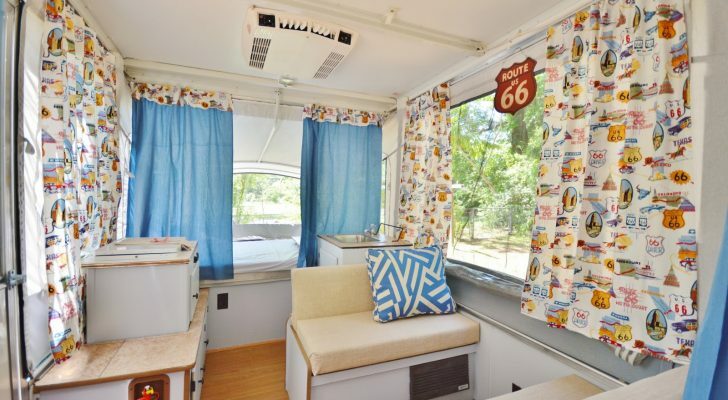 The company offers special RV and camping tips, invitations to special events and gifts if you purchase a Homegrown Trailer or rent one for six nights. More history on how Homegrown Trailers came to be.